Review: King Cobras! 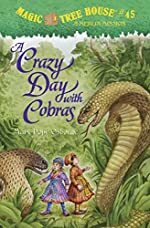 A Crazy Day with Cobras is written by Mary Pope Osborne and it is the 45th book in the Magic Tree House series. Also, it is mostly fiction with small passages filled with facts. Annie and Jack travel back in time 400 years to India. The Magic Tree House Books are mainly for children ages 12 and under. As they travel back in time to India, Annie and Jack are heading for a lot of trouble and scary situations. Suddenly, after school Teddy and Kathleen came to tell Jack and Annie that something is wrong. Annie and Jack are brother and sister who found a Magic Tree House in the woods and constantly something goes wrong and they go on a mission to help their magical friends. Two of the magical friends are Teddy and Kathleen. They live in Camelot and Merlin is the leader of Camelot. His favorite orphan penguin, Penny, has been turned into stone by Teddy and they have to save the penguin by collecting four objects. Teddy and Kathleen uncovered the first one which is an emerald shaped in a rose. Jack and Annie travel to Agra, India where the Great Mongol, Shah Johan, ruled. They pretend to be ambassadors from Frog Creek. They find the Emerald stone but, Annie's love of animals causes Jack and Annie to stay longer and head for more trouble. I liked A Crazy Day with Cobras very much. It contains facts with some fun and adventurous fiction. Some of the characters actions are funny. In fact, they sounded so calm in scary situations. Also, the illustrations are excellent. You can really see what the characters are doing. You can also see the situations and what the characters are seeing. A Crazy Day with The Cobras was really awesome and I liked ending. Also, the author didn't make the beginning slow so you wouldn't be bored for a long time before Jack and Annie would get mixed up in dangerous. All the 45 Magic Tree House books are good. This book was one of the best Magic Tree House books I have read. We would like to thank Random House for providing a copy of A Crazy Day With Cobras for this review. Have you read A Crazy Day With Cobras? How would you rate it?